(Newser) – Japan has overtaken China as the top foreign holder of US Treasury securities, a position the country last held in August 2008. In its monthly report on bond holdings, the Treasury Department says total foreign holdings of Treasury debt dipped 0.9% in February to $6.16 trillion, down from a record of $6.22 trillion in January. The holdings of China, normally the top holder of Treasury debt, slipped 1.2% to $1.22 trillion; Japan's fell 1.1% from January. China's decline was a bit larger, allowing Japan to jump into the top spot, $700 million above China, which overtook Japan for the top spot in ownership of Treasury debt in 2008 as the financial crisis pushed up US government borrowing. its interesting that almost half of US debt is owed to itself through Social Security, Federal Reserve Ect. Thank you Obo for doubling it, lefties will blame GW until 2150 at least. Everybody is dumping US dept. 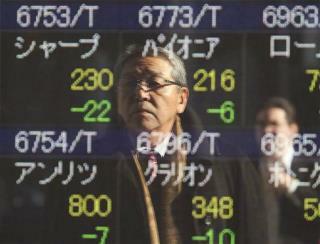 "and Japanese investors are attracted to dollar holdings because of higher rates of return." Probably only in Japan would our 0.50% interest rates be attractive. Both China and Japan are tightwads compared with our Fed. Most U.S. treasuries are bought with fake money.